Whenever I have the pleasure of spending time in Yellowstone park I am blown away by the beautiful saturation of colors, the sweeping landscapes and the wonderful surprises that await you every time the road (or river) bends around the next corner. 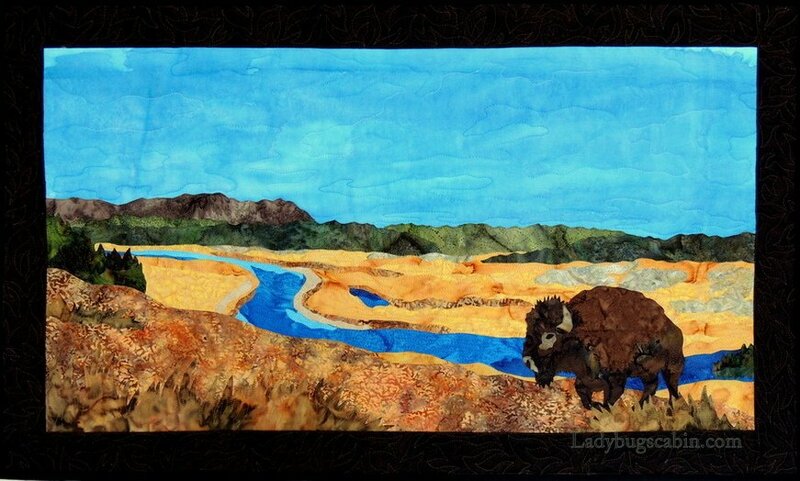 This piece is based on one of my favorite views along the Gibbon River and accompanied by one of the majestic bison that wander freely throughout the park. Kit includes the pattern and the fabric to make the quilt top, plus binding. Fusible, Batting, and Backing are not included. Fabrics may or may not be exactly as shown on photo or sample. Finished size: 34" x 20". Monique Kleinhans, designer.